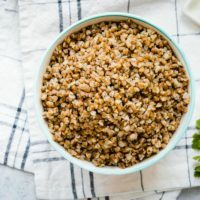 This is Part 3 of series of 4 posts about how to use your Instant Pot. You’ve decided to take the plunge and buy an Instant Pot – congrats! However, shopping for your first Instant Pot can be a little overwhelming. There are so many models, features and sizes. Which one do you choose? Before you consider all the bells and whistles that come with an Instant Pot, evaluate what size you’ll need. 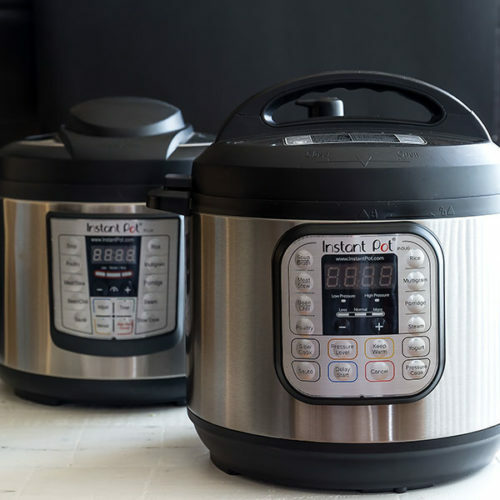 Instant Pots range in size from 3 – 8 quarts. 3 quarts – feeds 1-2 people. It’s ideal for preparing small meals or side dishes. This size is only available in select models. 6 quarts – feeds up to four people. This is the most common size and available in every model. 8 quarts – great for families of four or more or for feeding large crowds. It is only available in select models. Your Instant Pot will come with a variety of features. For some, it’s obvious what they do. For others, it may not be so clear. Keep Warm – the warming mode comes on automatically after the cooking cycle has ended. You can also turn this on manually to keep food heated until you’re ready to eat. Delay Start/Timer – this button allows you to delay cooking for a predetermined amount of time. Slow Cook – this mode is comparable to the functionality of a slow cooker. You can adjust the heat level to low, medium, or high, just as you would a slow cooker. Sauté – acts just like an electric skillet. 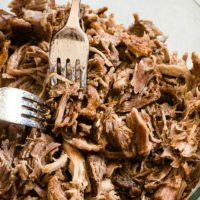 Use this function to brown meat or soften vegetables right in the Instant Pot without having to dirty a skillet. Choose from low, medium or high heat and once you’re finished, you can instantly switch to a different setting. Manual/Pressure Cook – this function allows you to choose from low, medium or high pressure. 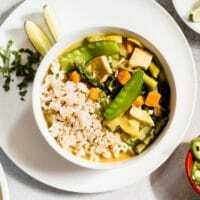 Food is cooked as the heat and pressure within the Instant Pot builds, which allows food to cook faster than traditional methods. Rice Cooker – ideal for cooking white rice. Poultry – great for quickly pressure cooking chicken for soups, tacos or other dishes. High setting will result in chicken perfect for shredding, while low will give you a more firm texture. Meat/Stew – great for quickly pressure cooking meat. 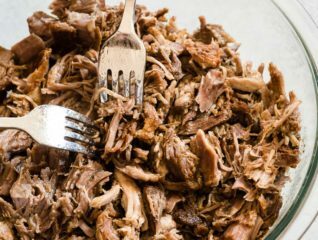 High setting will result in beef perfect for shredding, while low will give you a more firm texture. 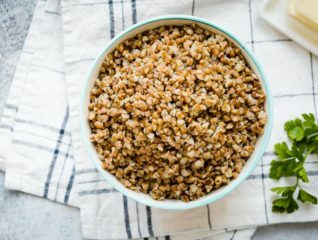 Multigrain – use this function for cooking brown rice and wild rice. Porridge – select this function for cooking rice porridge, oatmeal or grains other than rice. 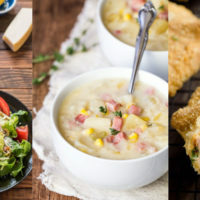 Soup/Broth – used for cooking stocks, broth, and soup without meat. 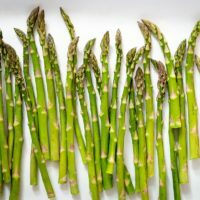 Steam – great for cooking vegetables, fish or seafood. Yogurt Maker – can pasteurizes milk in addition for fermenting milk for yogurt making. Beans/Chili – this option is perfect for cooking dry beans or preparing your favorite chili recipe. 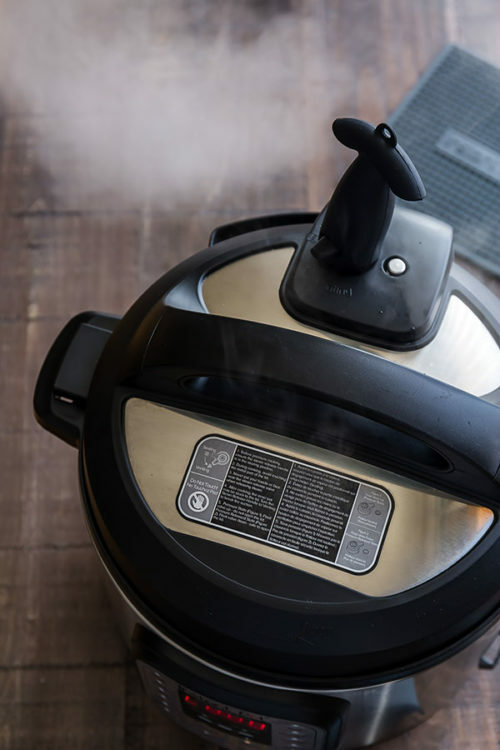 Cake – yes, you can bake in an Instant Pot. This function is designed to pressure cook soft, moist cakes. Sterilize – use to pasteurize milk, and sterilize baby bottles, jars, and utensils. 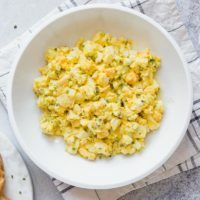 Egg – the high setting for this function will produce hard boiled eggs. For soft boiled eggs, select the low setting. 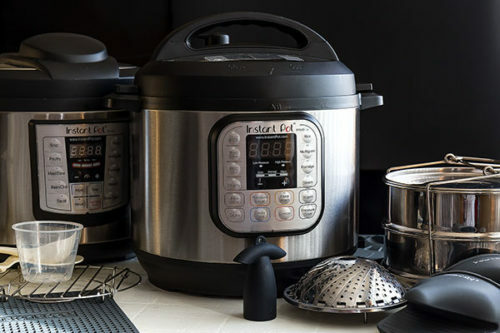 Instant Pot currently comes in six basic models. Let’s compare the features of each. Prices reflect approximate retail value for the 6-qt. model. Includes all of the standard features. The Lux V3 model includes the cake and egg setting, but lacks the poultry setting. 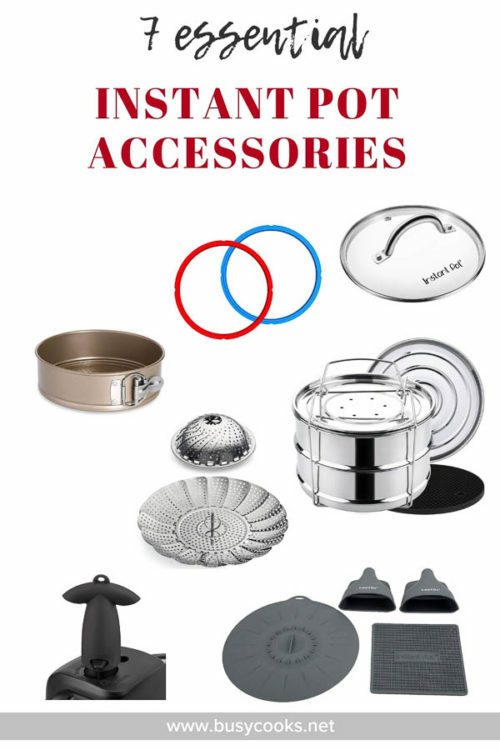 Accessories include recipe booklet, soup spoon, rice paddle, measuring cup and steam rack without handles. Comes in 3-, 6- and 8-quart sizes. Includes all of the standard features, plus yogurt and bean/chili features. Accessories include recipe booklet, soup spoon, rice paddle, measuring cup, steam rack with handles and a lid holder. Comes in 3-, 6- and 8-quart sizes. Includes all of the standard features, plus yogurt, bean/chili, cake, sterilize and egg settings. Lacks the poultry function. Accessories include recipe booklet, soup spoon, rice paddle, measuring cup, steam rack with handles and a lid holder. Comes in 3-, 6- and 8-quart sizes. Includes all of the standard features, plus yogurt, bean/chili, cake, sterilize and egg setting. Lacks the poultry function. Accessories include recipe booklet, soup spoon, rice paddle, measuring cup, steam rack with handles and a lid holder. Comes in 6-quart size only. 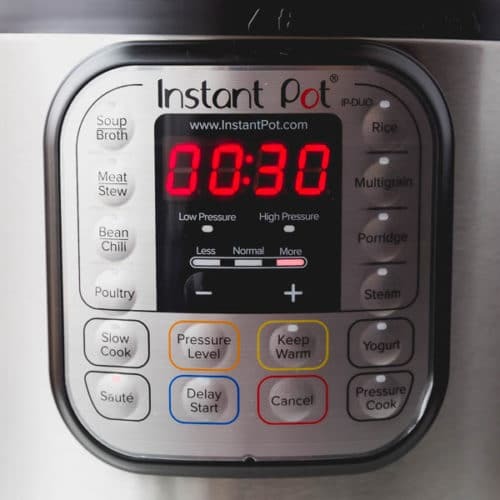 The most significant feature of this model is that it allows you to connect to your Instant Pot through the IP App. The app includes over 750 preprogrammed recipes to choose from — simply add your ingredients and choose your recipe from the list for the optimum cooking time. From the app, you can also monitor cooking time and how long the recipe has been kept warm. Includes all the standard features, plus yogurt and bean/chili functions. Accessories include recipe booklet, soup spoon, rice paddle, measuring cup, steam rack with handles, lid holder and silicon mini mitts. Comes in 6-quart size only. Obviously, this is the Cadillac of Instant Pots. Connect your Instant Pot to your smartphone using Bluetooth technology. Not only can you control and monitor cooking remotely through the IP app, but you can create your own multi-step recipes, called scripts. It also cooks up to six times using up to 70% less energy. Includes all the standard features, plus yogurt and bean/chili. Accessories include recipe booklet, soup spoon, rice paddle. measuring cup, steam rack with handles, lid holder and silicon mini mitts. Comes in 6-quart size only. The stainless steel inner pot, sealing ring, lid, steam rack, soup spoon, rice paddle, and measuring cup are all dishwasher safe. Be sure to wipe spills on the exterior of the cooker base with a damp cloth. 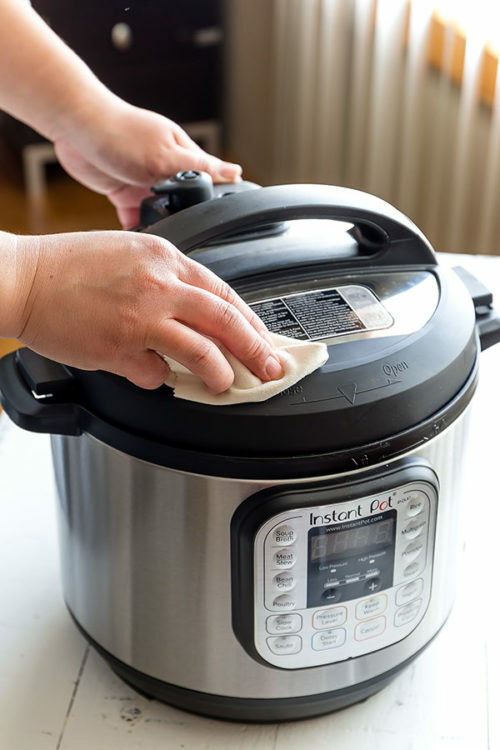 You can use a damp cloth to clean the inside of the Instant Pot. It is also a good idea to run a damp rag around the lip of the pressure cooker. Stackable Steamer Pans – These stackable pans are the most used accessories. Perfect for pot in pot cooking, that allows you to cook large portions, or different foods at the same time. Vegetable Steamer Basket – This vegetable steamer basket is compact easy to use tool for small portions of vegetables. 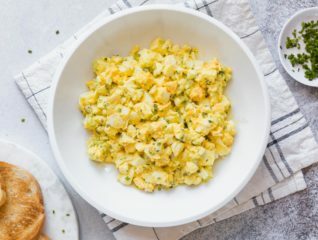 Actually not just for veggies, you can also steam eggs, dumplings, anything. Blue and Red Sealing Rings – Did you know you can bake dessert in your Instant Pot? Yes, but if you’re going to bake a cheesecake, for example, do use a different ring. You don’t want you cheesecake taste like curry! This blue and red sealing rings makes it easy. Blue for savory, red for sweets, or vice versa. Springform Pan – So you decided to bake said cheesecake in your Instant Pot. What now? Well, first you need a springform pan that will fit in inner pot of your Instant Pot. This 7-inch pan works perfect in 6qt and 8qt Instant Pots!! Steam Diverter – I used to cringe every time I had to Quick Release pressure, because hot steam would go directly onto my cabinets!! This little silicone is a cabinet-saver!! Love, LOVE this!! Instant Pot Silicone Starter Set – A set of silicone mini mitts, heat resistant pad and suction lid is basically a must for every Instant Pot owner. But if you just need the mitts, here it is. Those mini mitts are a MUST! Instant Pot Tempered Glass Lid – This lid is perfect for sautéing and slow cooking. You can easily have a peek inside.